In cosmopolitan Singapore, everyone and everything is hectic and fast-paced. Yet in a corner of Singapore, exists a place where time slows down to a peaceful pace, and residents enjoy a simple yet relaxing lifestyle, content with their status quo. The land was first acquired by Mr Sng Teow Hoon, a traditional Chinese medicine seller, who rented out land for people to build homes. It was later handed down to his children, one of whom is Miss Sng Mui Hong, who is currently still living in the kampong. Kampong Buangkok used to house about 40 familes, but has since shrunk to the size of approximately two soccer fields with less than 30 families now. Each family pays a token sum of less than $30 to Miss Sng as monthly rent. We’re currently living in a world where we’re glued to our smartphones. But, there are many reasons why you should distance yourself from your screen. Dr Devra Davis, an American scientist, has been studying the effects of mobile phone radiation for years. She found that phone radiation has been used in the medical field to treat liver cancer, detect cancer and enhance the absorption of drugs in the brain. 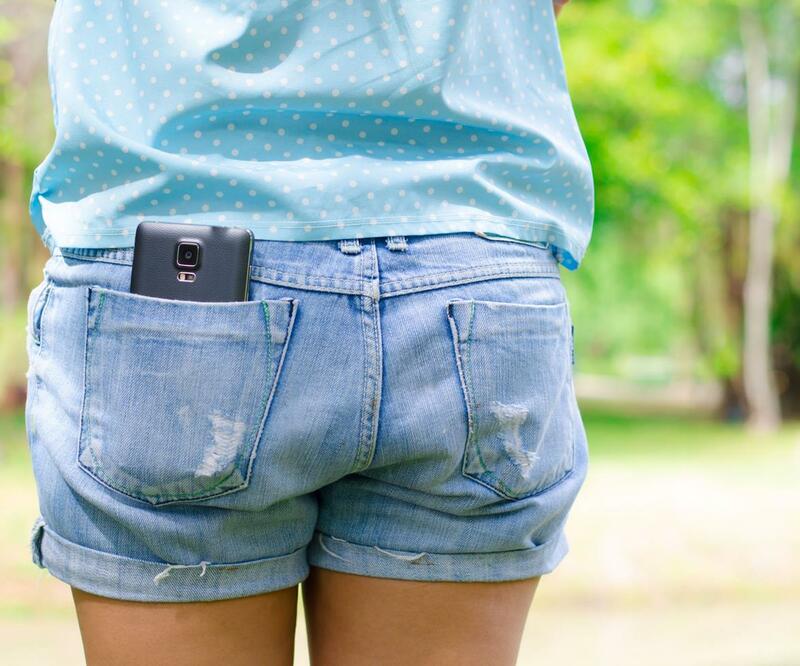 Furthermore, she found that if you store your phone in your pocket, it could weaken your pelvic area and reduce bone density. 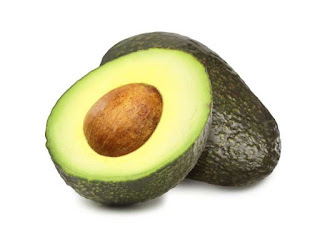 Store it in your bra? Dr Davis explained a case where a young woman developed breast tumours exactly the same shape as her phone that she’d been tucking into her bra. If that’s not scary enough, researchers have also found mobile phone use could also contribute to the development of depression, diabetes and heart irregularities. 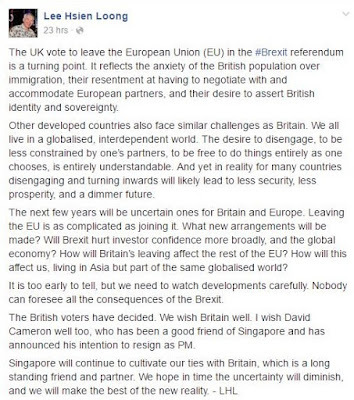 Political figures in Singapore have expressed their views after a historic referendum which shows that UK would leave the European Union (EU) on Friday. Grace Fu, Minister for Culture, Community and Youth said that the effects of the referendum would soon to be seen. 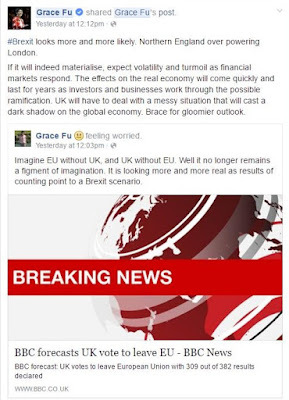 "The effects on the real economy will come quickly and last for years as investors and businesses work through the possible ramification...UK will have to deal with a messy situation that will cast a dark shadow on the global economy. Brace for gloomier outlook," said Fu. Britain's vote to leave the European Union (EU) is a turning point, Prime Minister Lee Hsien Loong said on Fri (Jun 24), after the UK voted in a referendum to leave the EU. 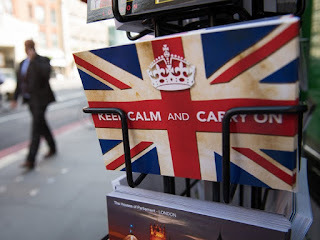 The decision reflects the anxiety of the British population over immigration, their resentment at having to negotiate with and accommodate European partners, and their desire to assert British identity and sovereignty, Mr Lee stated. 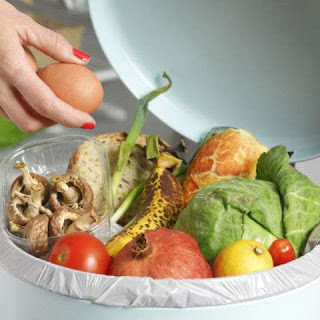 "Other developed countries also face similar challenges as Britain. 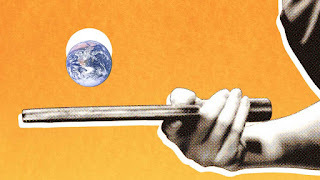 We all live in a globalised, interdependent world. The desire to disengage, to be less constrained by one’s partners, to be free to do things entirely as one chooses, is entirely understandable. And yet in reality for many countries disengaging and turning inwards will likely lead to less security, less prosperity, and a dimmer future." The UK vote to leave the European Union (EU) is “a turning point” reflecting the anxieties of the British population, and the next few years will be uncertain ones for Britain and Europe, said Prime Minister Lee Hsien Loong, as he cautioned against the consequences of countries disengaging from the world. 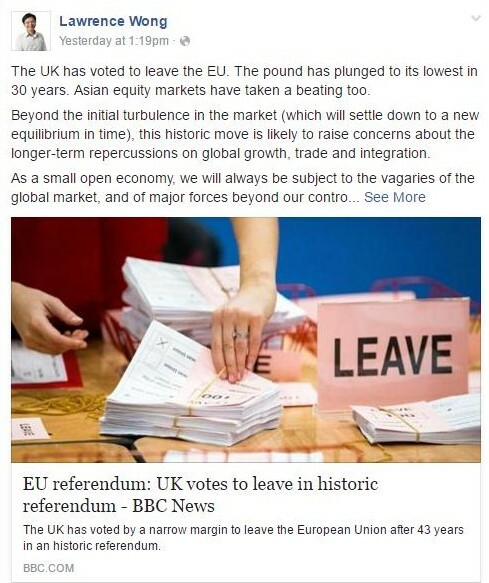 When the results became official, Mr Kausikan said Britain will be “a much diminished (nation)”, adding that, with it leaving the EU, it is “divided and certainly on a faster downwards trajectory”. 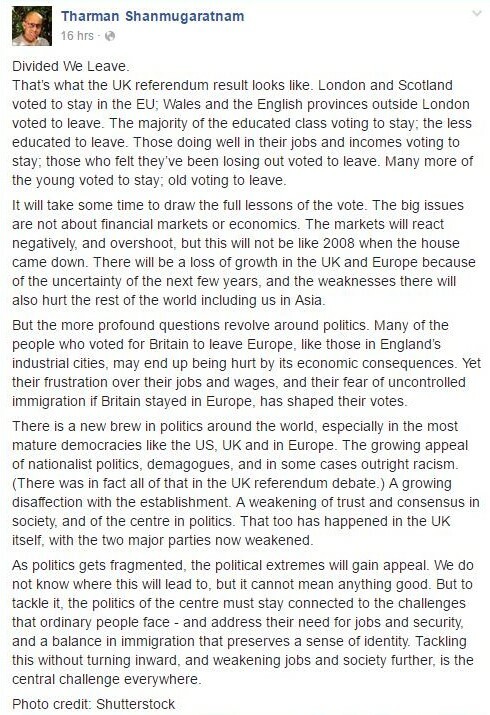 The UK vote to leave the European Union (EU) in the ‪#‎Brexit‬ referendum is a turning point. It reflects the anxiety of the British population over immigration, their resentment at having to negotiate with and accommodate European partners, and their desire to assert British identity and sovereignty. Other developed countries also face similar challenges as Britain. We all live in a globalised, interdependent world. The desire to disengage, to be less constrained by one’s partners, to be free to do things entirely as one chooses, is entirely understandable. And yet in reality for many countries disengaging and turning inwards will likely lead to less security, less prosperity, and a dimmer future. The next few years will be uncertain ones for Britain and Europe. Leaving the EU is as complicated as joining it. What new arrangements will be made? 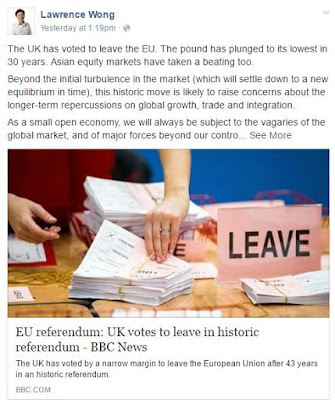 Will Brexit hurt investor confidence more broadly, and the global economy? How will Britain’s leaving affect the rest of the EU? How will this affect us, living in Asia but part of the same globalised world? As politics gets fragmented, the political extremes will gain appeal. We do not know where this will lead to, but it cannot mean anything good. But to tackle it, the politics of the centre must stay connected to the challenges that ordinary people face - and address their need for jobs and security, and a balance in immigration that preserves a sense of identity. Tackling this without turning inward, and weakening jobs and society further, is the central challenge everywhere. Foreign Affairs Minister Vivian Balakrishnan said he did not expect the Singapore-UK relationship to change significantly as the two had always had a "strong traditional relationship in the economy, in diplomacy, and even in defence relations". "For instance, almost half our investments in the EU actually go to the UK ... I don't expect that to change significantly," he said on the sidelines of a Maker Faire event. Meanwhile, Minister for Culture, Community and Youth Grace Fu said that there will be market turmoil ahead, which will affect Singapore. "The effects on the real economy will come quickly and last for years as investors and businesses work through the possible ramification," said Ms Fu. 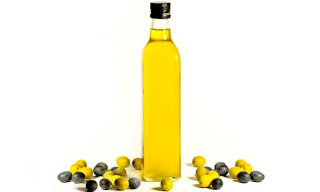 "UK will have to deal with a messy situation that will cast a dark shadow on the global economy. Brace for gloomier outlook." "Singapore thrives in a market with free trade and movement of goods and funds," she added in a reply to a comment from a member of the public. "If this signals a more nationalistic and protectionist world, it will not be good for us." Beyond the initial turbulence in the market (which will settle down to a new equilibrium in time), this historic move is likely to raise concerns about the longer-term repercussions on global growth, trade and integration. As a small open economy, we will always be subject to the vagaries of the global market, and of major forces beyond our control. So while Brexit may not be uppermost on our minds, we will have to be prepared for the consequences of the decision taken today. For us in Singapore, it's yet another reminder that we must continue to stay alert and nimble; to continually adapt and innovate; to survive and thrive in an uncertain world. Will the Government be pressured to step down? What will Scotland do, having voted to stay in EU? Will other EU countries want referendums to leave too? Whatever the ramifications, no one doubts that this is a monumental, historic moment for this generation. What do we in Singapore learn from this? For me, the most important lesson is that change is inevitable and that when it comes, it is the solidarity of a nation’s people with each other and their leaders that will pull them through. Tomorrow will be a different world for UK people, and only unity and common purpose will lead them through safely and for a better future. Disunity and lack of strong leadership will blight their future, however they voted in the referendum. Ambassador-at-Large Bilahari Kausikan also weighed in on the Brexit vote. “It isn’t often you see a country commit suicide before your eyes,” said Mr Bilahari to Channel NewsAsia. “We are also witnessing the tragically irrational consequences of western democracy. The UK is only an example of the dysfunctionality of a system taken to extremes," he added. 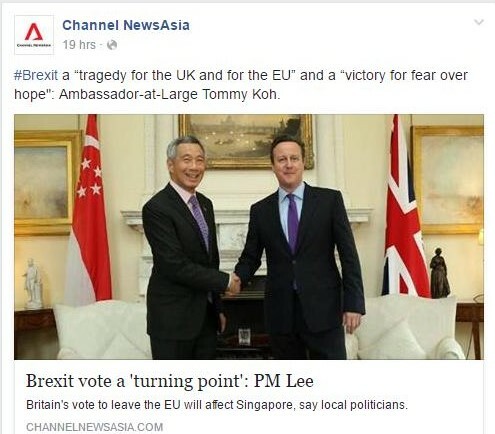 In a Facebook post, Ambassador-at-Large Tommy Koh said Mr Cameron had "messed up big time by holding an unnecessary referendum". "The result is a tragedy for the UK and for the EU. It is a victory for populism over rationality. It is a victory for fear over hope. It will probably lead to the secession of Scotland from the UK," he wrote. "The global wave of populism which is sweeping the world is a danger to democracy and to democratic institutions. Let us hope that it will not invade Singapore," he added. 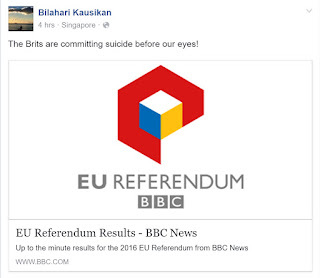 In the meantime, Singapore's Ambassador-at-Large Bilahari Kausikan showed his concern. 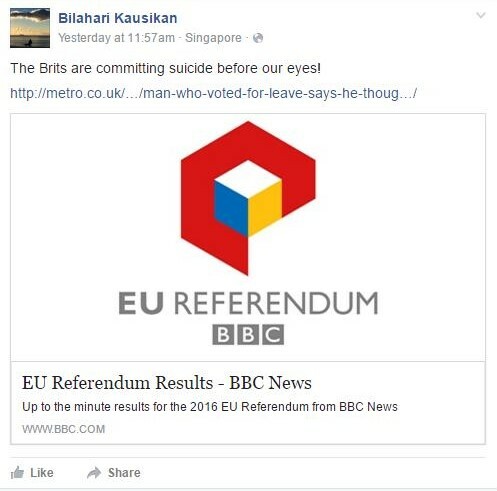 "It isn't often you see a country commit suicide before your eyes," said Mr Bilahari. "We are also witnessing the tragically irrational consequences of western democracy. The UK is only an example of the dysfunctionality of a system taken to extremes." 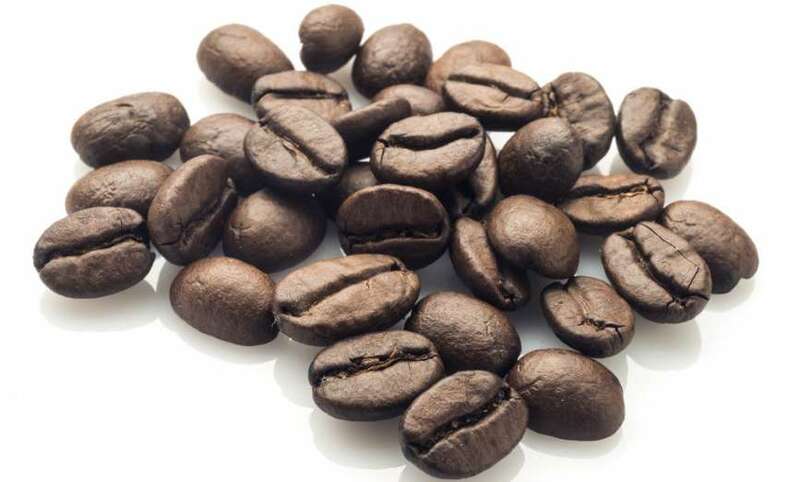 Singapore's National Development Minister Lawrence Wong also gave his comments, saying that such a move would pose long-term implications on global growth. In the lead-up to the UK's European Union referendum, the Leave campaign was long on playing up fears and short on substance ("Facts no longer seem to matter in campaigns"; last Wed). Many of the emotionally charged messages were beset with lies, half-truths and misinformation. These messages might have clouded minds and hearts about what is at stake for the future. It is not often that such a huge interest in financial markets is taken by non-market practitioners. Nonetheless, with the excitement akin to a World Cup Final, many were focused on Friday’s Brexit result. Singaporeans in particular – with their own unique brand of opportunism, jumped at the opportunity to take advantage of the lower GBP exchange rates. While a cheaper UK holiday or cheaper clothes from online UK retailers are all wonderful things to celebrate about, the longer term perspective of the Brexit event needs to be considered as well. While the one-day move is tremendous, with the breaking of serious technical support, the current level of GBP/SGD is not exactly at all-time ridiculous historical lows. In fact, you could have gotten approximately the same rate in 2013 or at 1.90 in April (not a huge difference from today’s 1.85 on a long-term basis). You probably would have had a better deal, given less time queuing at the money changer coupled alongside smaller bid-ask spreads. Of course it could go lower from this point – but current exchange rates don’t really warrant such enthusiasm for money changing yet. 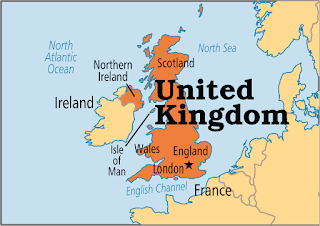 The United Kingdom has voted leave the European Union (EU) by a vote of 52% to 48% on 24 June 2016 in its referendum to decide whether to leave or remain in the EU. According to the results, Votes to leave the EU won the majority of votes in England and Wales, while every council in Scotland saw votes to remain in as majorities of the votes. 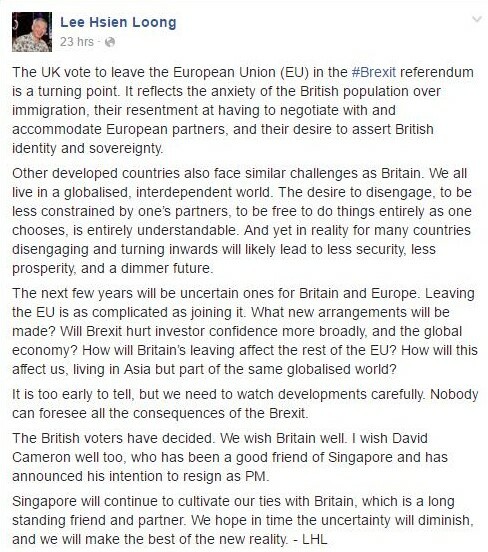 In response to the results of the referendum, Prime Minister of Singapore, Mr Lee Hsien Loong posted his views on his Facebook page. The voters of UK have finally decided to leave EU with the results of the referendum showing 52% in favor of leaving and 48% against. Soon after the results were out, UK PM David Cameron announced his resignation. 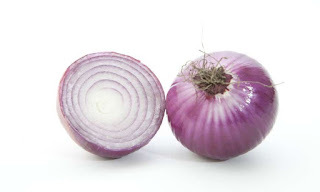 “I think the country requires fresh leadership. I do not think I can be the captain to take the country to its next destination,” he said, fighting back his tears with his voice breaking. NOBODY is saying a good thing about Brexit. Which means that the majority of British voters (okay, 52 per cent who voted Leave Euro) could possibly be wrong? Gasp. The fallout is immediate and bad. The poor pound has got poorer, down to 31 year low, and stock markets around the world are taking a dive. Take a look below. So the economic/business types are reacting badly. British PM David Cameron, roundly castigated for holding the reckless referendum to appease Eurosceptics in his own party, has resigned. Whoever takes over the job will have to see how to negotiate the divorce settlement with the European Union. It will take at least two years to sort through the tangle of treaties and financial arrangements. But the new PM is expected to immediately do something about immigration – since that appears to be the message from voters which Mr Cameron described as “an instruction to deliver”. "It isn’t often you see a country commit suicide before your eyes." "We are also witnessing the tragically irrational consequences of western democracy. The UK is only an example of the dysfunctionality of a system taken to extremes." Following the official announcement of Britain’s exit from the European Union, leaders of the Singapore government reacted very negatively with Deputy Prime Minister Tharman calling it “outright racism”. Yesterday (Jun 24), the British majority voted to leave the European Union (EU) in a referendum mainly because of the hefty amount of English taxes spent on helping other poorer countries in EU like Greece. Britain was the second-largest economic power, below Germany, who have to pay up to 350 million pounds a week to EU because of it’s membership obligation. English voters contend that the money could be better off spent on local investments, especially on it’s ailing healthcare system. Another key issue behind the British exit, aka Brexit, is the influx of cheap foreign labour from the Europe continent. Salaries were depressed in the decade and the middle and low income saw falling income because of the liberal immigration policies. 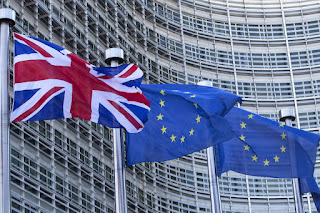 Britain were also denied from the rights to make independent policies without consulting other EU members, which pro-Brexit supporters felt is an infringement of their sovereignty. 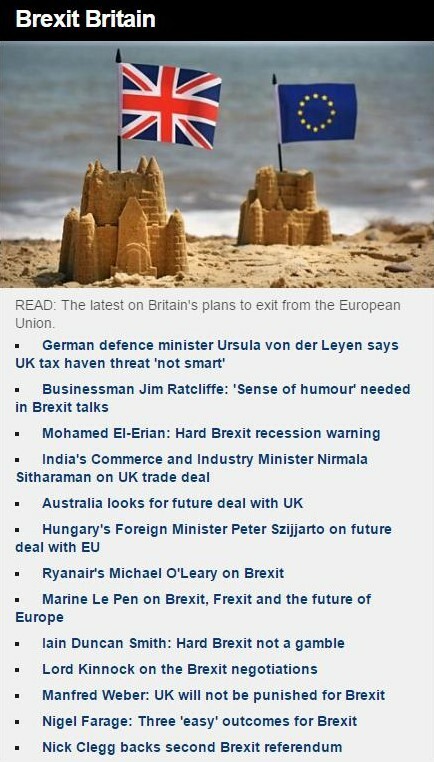 Brexit: What Next for the EU? Lee Bee Yee was sleeping on her flight from Singapore to Milan early Monday morning when the flight crew informed her and the more than 200 people on board that their flight would be turning back to the airport. They’d been in the air for two hours, she told Channel NewsAsia, and the plane smelled strongly of fuel. The pilot said the right side engine was leaking oil, she told the TV station, which meant that they’d have to proceed without it. 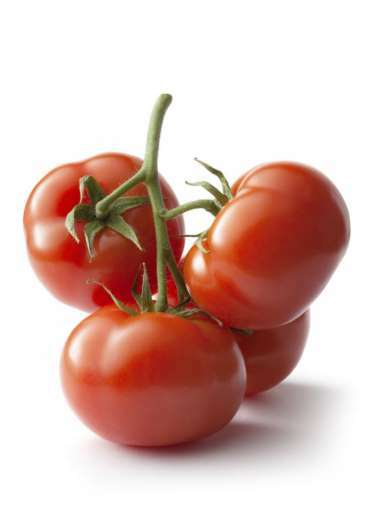 But that would make the whole plane vibrate, unfavorable conditions for the flight to Milan. 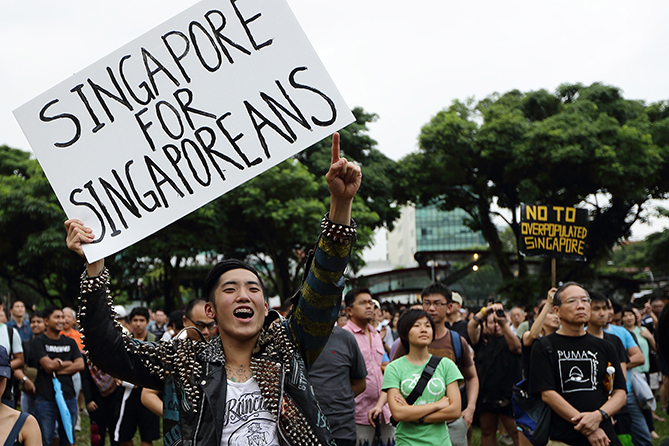 She and her husband didn’t think much of it, she told Channel NewsAsia. Traveler Yee Bee Lee, 43, said she “escaped death” after a Singapore Airlines flight from Changi Airport began leaking oil on Monday. Our Singapore Airline plane was leaking oil three hours flying off and the plane had to turned back. 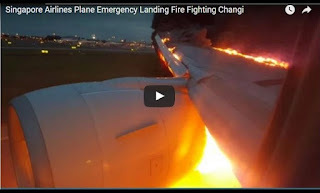 After reaching Changi Airport, as the plane was landing, the engine burst into flames!!!! Huge fire was burning! See video! It was a heart-wrenching five mins! Waiting for the fire engine and firefighters to put out the fire! They shot foam and water into the fire and eventually it was put out! We were so close to death!! I am still in the plane with all passengers. But I think we are safe for now….they will be evacuating us soon. One woman claimed the Singapore Airlines jet was leaking oil for three hours before being forced to turn back. 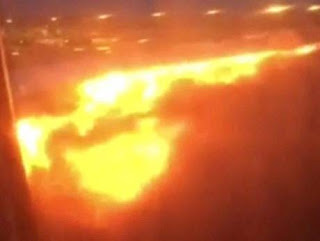 Passengers have spoken of their terror after their Boeing 777 burst into flames as it made an emergency landing. 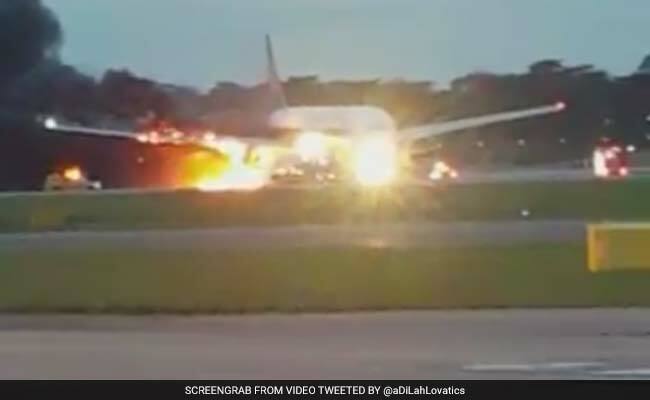 Shocking pictures and footage capture the moment the engine exploded just as the Singapore Airlines jet touched down. The aircraft’s right engine caught fire after the aircraft, a Boeing 777-300ER, touched down about 6:50 am (8:50 am AEST). According to Channel News Asia, two hours had passed and shocked passengers heard the pilot make an announcement that the plane was to return to Singapore, because of a problem detected in the engine. The plane’s control had presumably been flashing an engine oil warning message. 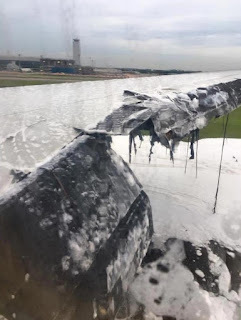 A SINGAPORE Airlines (SIA) flight enroute to Milan from Singapore this morning caught fire after being forced to make an emergency return to Changi Airport. All passengers are unharmed. According to a statement by SIA, flight SQ368 took off at around 02.05am but had to turn back after pilots detected an engine warning. 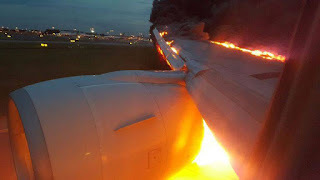 The Boeing 777-300ER safely landed at about 06.50am but its right wing went ablaze shortly after with all 222 passengers and 19 crew still onboard. 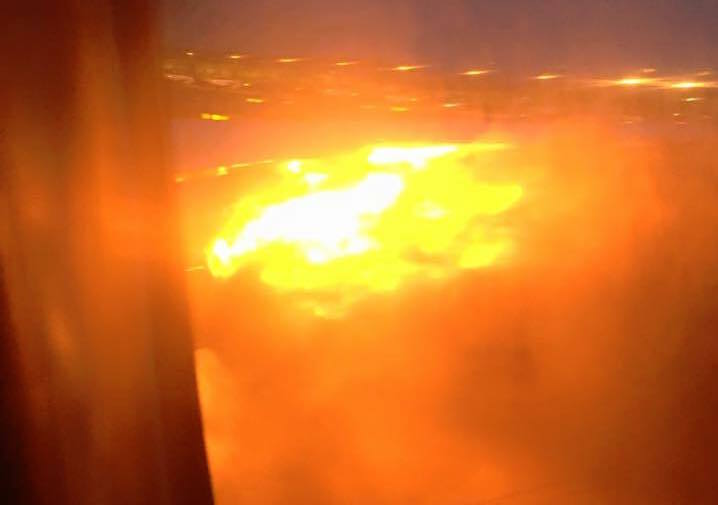 Airport emergency services were activated and put out the flames caused by a fuel leak. Passengers then disembarked via stairs with no one injured. SIA said that passengers will be transferred to another aircraft which is expected to depart for Milan on the same day. More than 240 people on board a Singapore Airlines flight on Monday had a narrow escape as their jet caught fire while making an emergency landing at Changi Airport here after it turned back en route to Milan but they were safely evacuated. The Singapore Airlines (SIA) Flight SQ368 departed from Changi Airport for Milan at 2.05am Monday but about two hours into the flight, the pilot announced that there was a problem in the engine and the flight had to turn back to Singapore. The SIA said in a statement that flight SQ368 was en route from Singapore to Milan when an "engine oil warning message" forced it to turn back. A Singapore Airlines plane caught fire Monday while making an emergency landing at Changi Airport after turning back from a flight to Milan following an engine oil warning message, the carrier said. 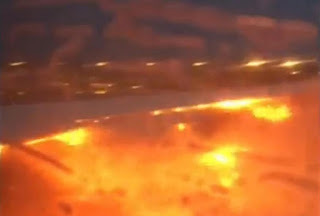 A Singapore Airlines plane bound for Milan caught fire shortly after making an emergency landing. Flight SQ368, which departed at 02:05 local time on Monday (18:00 GMT Sunday), was two hours into the flight when the pilot announced there was an engine problem. 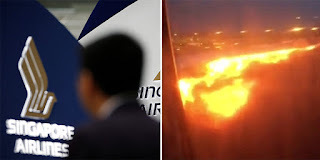 The plane turned back and landed before the right engine of the Boeing 777 burst into flames. 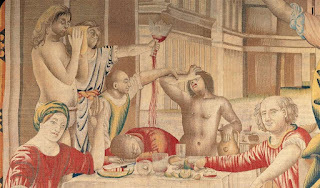 I don’t know about you, but if there’s one thing that’s always bugged me about eating in restaurants it's having to wear clothes. 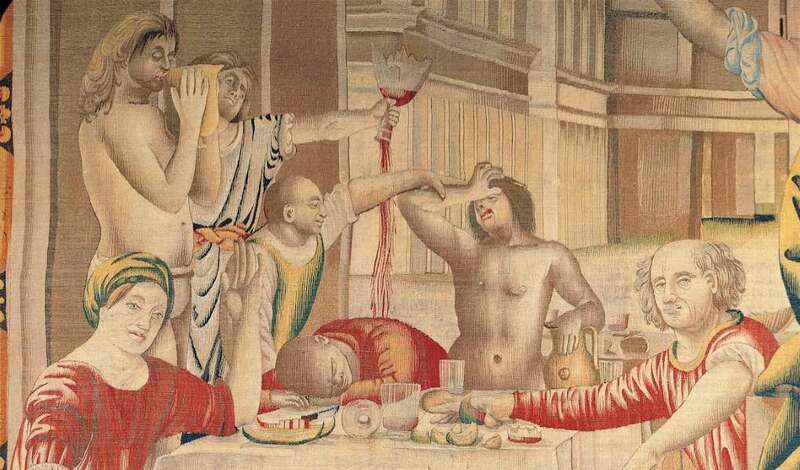 Why stain them when you can imbibe as the Romans might, naked, with sauce and wine spilling all down your body? This is presumably the gap in the market The Bunyadi is hoping to fill, a pop-up restaurant coming to London this summer for three months. "Enter a secret Pangea-like world," its website promises, "free from phones, electric lights and even clothing (optional) and revisit the beginning where everything was fresh, free and unadulterated from the trappings of modern life." Populist and Eurosceptic parties across Europe moved to capitalise on the UK’s decision to vote for Brexit by congratulating Britain on its vote for “freedom” and calling for referendums on EU membership to be held in their own countries. “Victoire de la liberte!” – “Victory for Liberty!” declared Marine Le Pen, the leader of France’s far-right National Front party as she welcomed the news from across the Channel, putting a Union flag on her Twitter account in a statement of French fraternity for English euroscepticism. Ms Le Pen, who is expected to reach at least the second round run-off for France’s presidential election next year, then called for “the same referendum in France and other EU countries" in a rallying cry to her own nationalist political base. What happens now the UK has voted Brexit - and what is Article 50? If there was any doubt that Brexit was “relevant” then the surges in European peripheral bond risk,despite massive bond-buying by The ECB, should send shivers up and down the status quo huggers that are shrugging the referendum decision off because “central banks will provide liquidity.” However, it’s not just The UK that EU officials need to worry about, as The Globalist notes, Germany will have to change its policies if it wants to avoid exit of other countries from the eurozone. After Brexit, Would It Be Swexit And Grexit? Is Europe a row of dominoes waiting for a push from Britain in tomorrow's vote? The contagion theory may have been a little over-egged, but there are reasons to think that if Britain leaves, others could follow. Take Sweden, for instance. On the face of it a thoroughly EU-loving country. Polls show a big majority of Swedes wanting to stay in the union. A union that includes Britain, that is. Fears of a “Grexit” from the EU mounted during the European sovereign debt crisis after 2009 and resurged last year as Greece attempted to renegotiate its liabilities with European creditors. The latter fight led to a national referendum held by the Greece’s left-wing leadership, Syriza, over whether to accept the terms of a bailout agreement that entailed sharp spending cuts and further austerity measures. Seen as a potential indication of willingness to leave the eurozone, Greeks rejected the bailout measures by a wide margin. 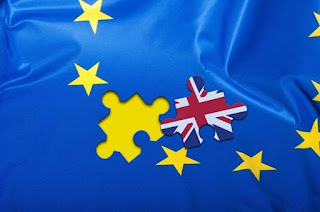 The question on everyone’s lips Friday morning as it became clear that voters in the United Kingdom had narrowly decided to leave the European Union was, "What now?" Even though U.K. 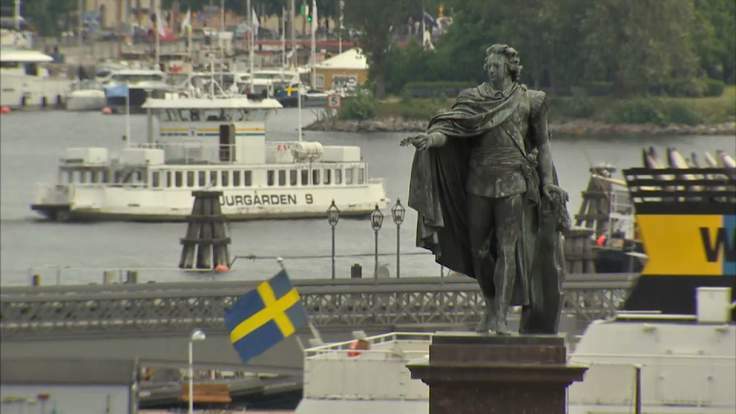 Independence Party leader Nigel Farage has declared June 24 “Independence Day,” it’s unclear exactly what is going to happen between now and when the United Kingdom formally decouples from the EU. One question on people’s minds: Will there be a second Brexit referendum? The answer is a tricky one. 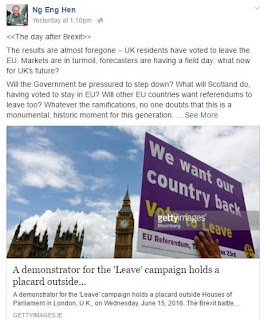 In the days and weeks leading up to the June 23 vote, many people on the Leave side — those who were campaigning to leave the EU — were saying that even if they were defeated in the referendum, they could keep campaigning afterwards. They ended up winning, but they’ve opened the door for defeated Remainers (those who wanted to stay in the EU) to clamor for their own second vote. In the wake of Thursday’s vote, Remain supporters crashed the U.K. government’s petitions website, where petitions that get 100,000 signatures automatically get considered for debate in parliament. One petition calls for the government to stipulate a rule that “if the remain or leave vote is less than 60 percent based a turnout less than 75 percent” that the government must hold another referendum, arguing that the question is too important to be decided by such a slim margin. At the time of writing, more than 155,000 signatures had been gathered. Scotland unanimously voted to Remain, Northern Ireland were largely Remain, but Wales were almost entirely Leave. Three experts from each region have their say "What have they done?" That was the overwhelming feeling on Friday as a shocked Scotland woke up to the news voters in England are to wrench them out of the European Union. When Scots can’t even be bothered celebrating David Cameron resigning, you know something has gone terribly wrong. And it wasn’t just the stock market crash, the run on the pound and the months and years of political chaos stretching out ahead that was causing dismay. What next for Europe as it faces its biggest ever crisis? As the sun rose over Brussels this morning the European Union awoke to a new dawn. In what had seemed an ominous warning, lightning strikes and torrential rain had engulfed the city throughout the night. The metaphor seemed too obvious. In fact it proved to be brutally accurate. The European Union has woken up to face the biggest institutional crisis since its foundation. The organisation which was formed from the ashes of World War II as a political and trade community but morphed and expanded into something much, much more, was unable to face the scrutiny of its people when it came to a referendum. 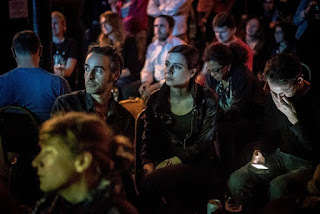 The north of England has roared back at London - this result underlines the disconnect between the capital and the outlying parts of England, writes Danny Savage. It showed in the results - London overwhelmingly In, huge parts of the north Out. 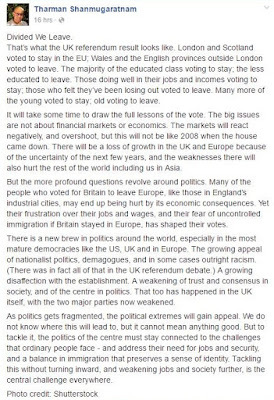 For many this wasn't just about Europe, it was about a metropolitan elite telling them what to do. And then rebelling against it. Throughout the campaign nearly everyone I talked to across this vast area was Out. A sunny day at Cartmel races in May saw people sporting 'vote leave' badges. The UK is, without a doubt, the United States’ single most important ally. It retains an ability to project power globally vastly in excess of its relative size. In both direct military operations and the hidden world of intelligence, the UK contributes more than its share to global peace and stability and the successful functioning of the NATO alliance. So what does Brexit mean for this important relationship. The UK’s departure from the European Union could trigger a series of unintended consequences across the UK itself, potentially setting the stage for Scotland’s secession from the country and a renewed round of clashes between nationalists and separatists in Northern Ireland. Scotland and Northern Ireland both voted heavily to stay in the EU, a conflict that Scottish nationalists say gives them standing to withdraw from the UK and that has Irish nationalists clamoring to reopen the long-simmering debate over British rule in a northeastern corner of the island. Scotland narrowly voted against independence from the UK back in 2014, was given big but as-yet-unfulfilled promises of greater autonomy, and voted by an overwhelming 62-38 margin to remain in the European Union. It would be hard to think of a more dystopian moment than Donald Trump crowing about Brexit in Scotland the day after the fateful UK referendum. The fact that the birthplace of Mr Trump’s mother — and host to a clutch of his golf courses — had rejected Brexit appeared to be lost on the Manhattan tycoon. The fact that he also revelled in the profitmaking opportunities presented by a nosediving sterling were also beside the point. Convention be damned. We are all background furniture in a Trumpian absurdist novel. It was Mr Trump’s moment to exploit. 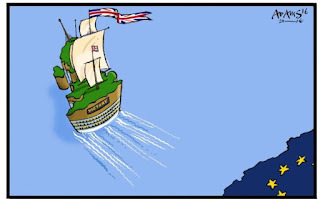 In the non-fictional world, Brexit’s impact on the US will be felt at many levels. The most immediate, via turmoil in the financial markets, is the easiest to predict. In the short term it may also be the least troubling. At times of uncertainty, investors flee to safe assets and the US Treasury bond market remains their first choice. There will be no need for the US Federal Reserve to reverse its sole interest rate increase from last December. The markets have already done that. US long-bond yields will keep going down. The dollar will strengthen. But longer-term investor uncertainty will only deepen. The damage to America’s global economic leadership will take longer to unfold. After Brexit, America’s hopes of concluding a transatlantic deal look extremely bleak. The EU has just lost its most outward-looking, pro-trade partner. Prospects for concluding the already stalled Transatlantic Trade and Investment Partnership thus look moribund. The knock-on effect on America’s big Pacific deal — the Transpacific Partnership, which has stalled on Capitol Hill — are harder to calculate. 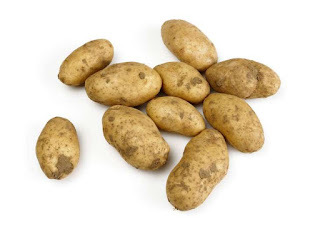 But they are unlikely to be good. Yesterday, Brits voted in a once-in-a-lifetime referendum calling for Britain's exit from the European Union. Dubbed the "Brexit," the vote, once thought to be a shoo-in for EU unity supporters, resulted in a shocker: 52% of Brits voted for the country to leave the EU, compared to 48% who voted to stay. Voter turnout was over 70%, the largest in the country since 1992. 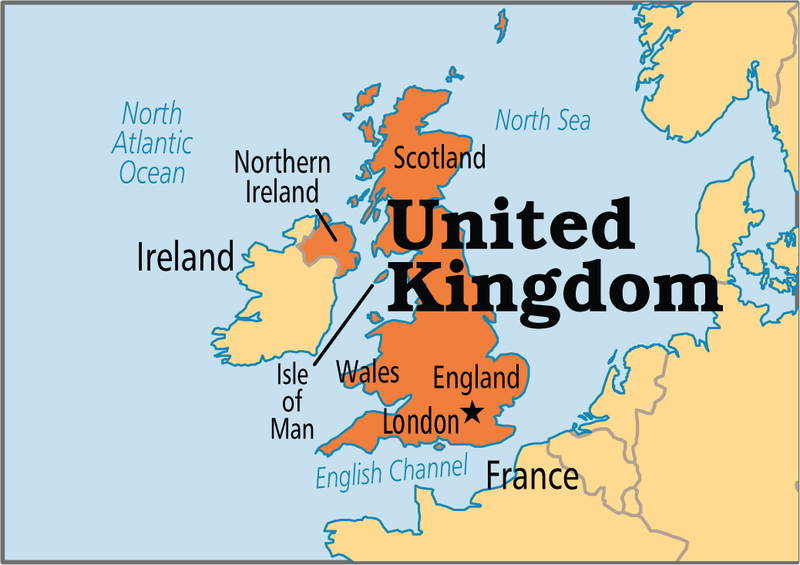 The debate over whether or not Britain belonged in the EU has been a never-ending one since the island nation joined in 1973. Supporters of British involvement in the EU say that the economic advantages far outweigh some of the more clunky bureaucratic elements of being part of a larger governing body. Opponents point to the EU as an undemocratic institution, and many of their arguments have been further strengthened by the ongoing immigration debate affecting all of Europe. Given the huge implications of the vote, it's unsurprising that the political and economic scenes have shifted entirely overnight. Prime Minister David Cameron has already announced that he is stepping down from office, as he believes it is the "will of the British people." None of the Above? Let's say you don't have any connection to Britain at all. If you're watching the drama unfold from your couch in New York, New Delhi or Abu Dhabi, will a Brexit still affect you? A drop in UK property prices would be handy if you're looking to invest in London's real estate market from afar. If the value of the pound drops, it might make the cost of a vacation to Edinburgh lightly less eye-watering. But although a Brexit would primarily hurt the UK economy, it could also have consequences for global financial markets - meaning your stocks might take a hit. In other words: we simply don't know what the divorce would look like. 'It was all about immigration' - Ben Farmer speaks to activists in Lancaster about the key issues that swung the campaign to leave. For the defeated Remain campaigners in Lancaster, there is no doubt about the campaign's most powerful issue. Traditionally strong Labour working class estates strongly rejected the EU because of fears over immigration and jobs. David Cameron is expected to address the nation this morning, and he may well be writing his speech now. Here are some of the questions he has to address. What will be done to calm the markets? With the pound in freefall, will the Bank of England intervene? There has even been talk of closing the stock market to stop panic selling of share. 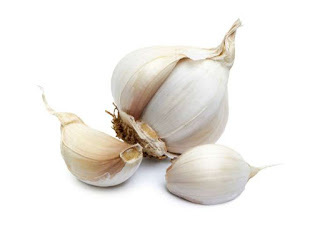 Cameron will have to say something to steady nerves. Will he remain as prime minister? No one expects him to leave Number 10 this morning, but does he really think he will be able to oversee the EU withdrawal process over the next few year? Perhaps he does. More likely, he will recognise that is unrealistic. In that case it is possible that he may announce his intention to stand down later this year, possibly before the Tory conference. Will he invoke article 50 of the Lisbon treaty immediately? This is the process that starts the two-year countdown to Brexit. Before the referendum Cameron said he would trigger article 50 straight away, but there is no reason why he should and every reason to delay. It makes no sense to start the two-year clock running until the UK knows what it wants. He would be wise to clarify his intentions. Will parliament be recalled? There is a strong case for saying it should sit on Saturday, to allow the government to assure MPs that it has a plan before markets open again on Monday. Who will be in charge of the withdrawal negotiations? This begs the huge question as to what mandate will apply to those doing the negotiating. Will Cameron seek cross-party agreement? Will he take the Vote Leave programme as a manifesto he is bound to honour? For example, will the UK definitely withdraw from the single market? Will there be an emergency budget? George Osborne said an emergency budget would be necessary this summer. Does that still apply, or will Cameron write that off as campaign scaremongering? Will there be an election? There is a case for saying a new prime minister may need a mandate for the withdrawal negotiations - although there are probably very few people in Westminster with the appetite for another election now? Does Cameron accept that the Scots have the right to have a second independence referendum? BBC: In stunning decision, Britain votes to leave the E.U. 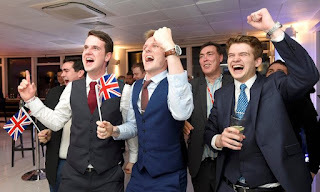 British voters have defied the will of their leaders, foreign allies, experts and much of the political establishment by opting to rupture this country’s primary connection to Europe in a stunning result that will radiate vast economic and political uncertainty across the globe. The result is perhaps the most dramatic to date in a wave of populist and nationalist uprisings occurring on both sides of the Atlantic and overturning traditional notions of what is politically possible. Britain has voted to leave the EU – what happens next? The UK’s historic decision to end its 43-year love-hate relationship with the European Union represents a turning point in British history to rank alongside the two world wars of the 20th century. On the assumption there is no turning back, or collective buyer’s remorse, Britain will live with the political, constitutional, diplomatic and economic consequences for a decade or more. The pin on the atlas marking the UK’s place in the world has shifted, just as the centres of power in the UK polity. 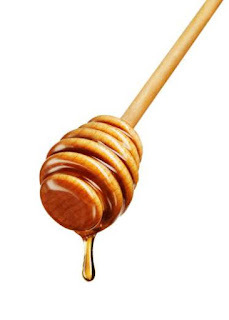 All the familiar points of authority in London society – Downing Street, big business, economic expertise, the foreign policy establishment – have been spurned by the equivalent of a popular cluster bomb. 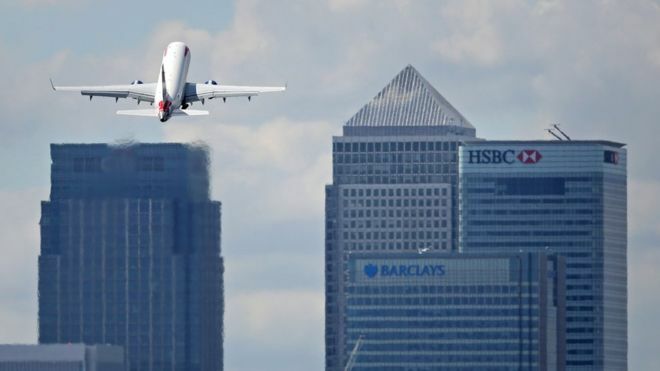 Will the City of London remain Europe's premier financial hub? The campaign to leave the European Union has won the referendum. It means the UK is now committed to withdrawing from the group of 28 countries, a process that has come to be known as Brexit. What does this mean for the UK and EU? The deal that Prime Minister David Cameron negotiated with the EU in February, giving the UK a special status as an EU member, will now be scrapped. The UK won a guarantee that it would not suffer discrimination by being outside the eurozone. 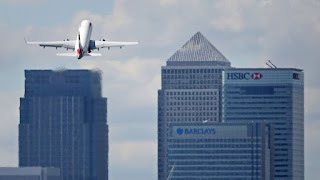 That was to safeguard the City of London's authority, as Europe's biggest financial centre. In return, the UK pledged not to block deeper eurozone integration. If the UK manages to negotiate continued access to the EU single market on preferential terms the deal is unlikely to include the non-discrimination safeguards. EU deal: Did PM get what he wanted? After the EU referendum result: What happens now? How much does the EU Budget cost the UK? Britain's exit will affect the British economy, immigration policy, and lots more. It will take years for the full consequences to become clear. But here are some of the most important changes we can expect in the coming months. A Brexit vote is not legally binding, and there are a few ways it could theoretically be blocked or overturned. However, as the BBC notes, "it would be seen as political suicide to go against the will of the people as expressed in a referendum." Britain has voted to leave the EU in a popular revolt that will send shockwaves across Europe, leaving David Cameron’s premiership hanging in the balance and triggering financial market turmoil across the globe. Mr Cameron’s hopes of securing a Remain vote evaporated as working-class voters turned out in huge numbers to deliver a stunning rebuke to the establishment and the status quo. With all the votes counted, 51.9 per cent voted to sever Britain’s 43-year membership of the EU, 48.1 per cent to stay in. SO THE gambler finally lost. David Cameron has usually been lucky, winning office in 2010 at the head of a coalition and then outright in 2015. He also kept the United Kingdom together in the Scottish independence referendum in 2014. But the prime minister’s gamble of promising a referendum on Britain’s European Union membership has failed. 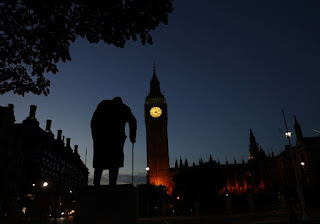 As the counting of votes cast on June 23rd neared completion in the small hours of the following day, it seemed that almost 52% of the electorate had voted for Leave against 48% for Remain. The turnout was 72%, six points higher than the level in the May 2015 general election. The response to the victory for Brexit was immediate. Nigel Farage, leader of the UK Independence Party (pictured), said June 23rd marked independence day for Britain. The pound slumped to its lowest level against the dollar since 1985 (see chart). Europe’s stockmarkets were poised to open lower as investors marked down the prospects for the British and global economies. Most economists agree with the Treasury that the British economy is now likely to fall into recession. George Osborne, the chancellor, had warned of an emergency budget, but that is unlikely. That is partly because political turmoil will be prolonged. Although Mr Cameron insisted before the vote that he would stay on as prime minister no matter what the result, few believed him. He is expected to resign, triggering a Tory leadership contest that cannot realistically be completed until late September. Mr Osborne may go. After the Leave victory, the next Tory leader is likely to be a Brexiteer. In a dramatic turn that polls did not predict and which markets failed to price in, the United Kingdom has voted to leave the European Union. Across Europe, markets opened deep into negative territory, with STOXX Europe 600 down 8 percent, the FTSE 100 opening down 7.83 percent, Germany's Dax down by 8.6 percent and the CAC 40 in France down by almost the same amount. How will the historic Brexit hit the EU economy? The European Union's chief concerns over Britain's vote to leave the group are political but losing its second-largest economy will have a huge economic impact as well. Other members will have to fill in at least some of the shortfall from a lack of its contributions. 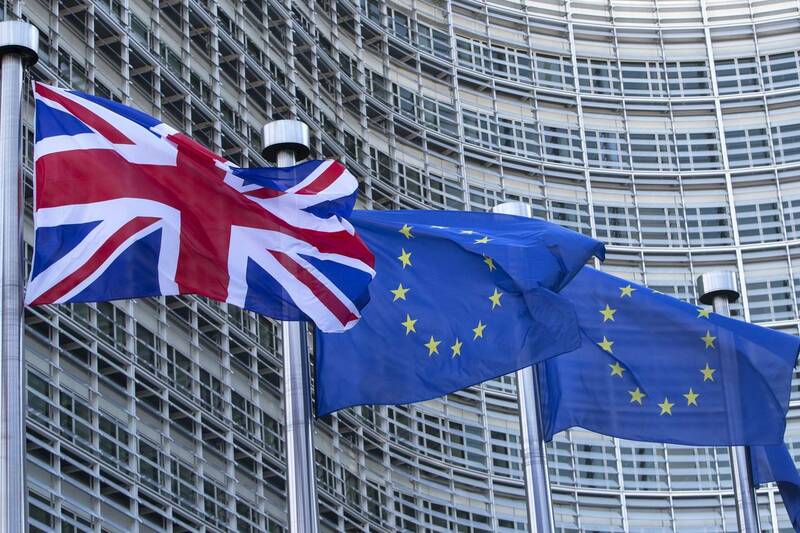 Britain's total contribution to the EU budget for 2016 has been set at 19.4 billion euros ($21.4 billion), including its rebate and customs duties. 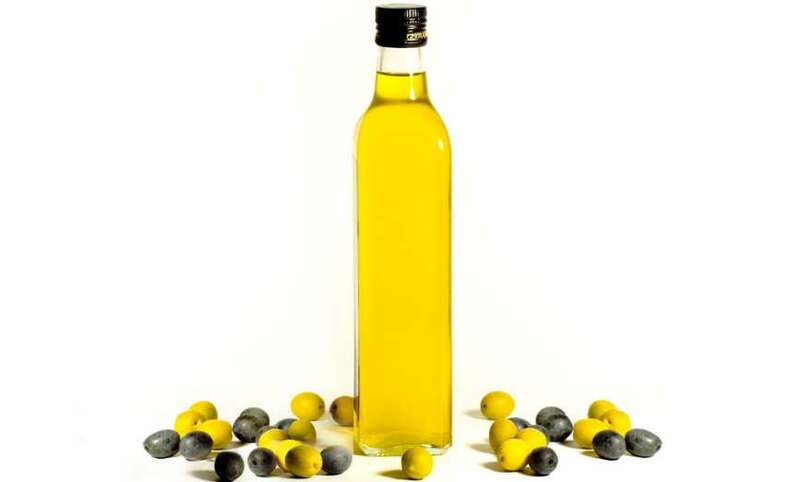 It receives about 7 billion euros, mainly agricultural and regional subsidies, leaving a gap to fill of just over 5 percent of the total EU budget. Germany, the EU's largest member, would inevitably have to provide the most extra cash. Germany's Ifo institute estimates that would be 2.5 billion euros. How soon before Bank of England chief Mark Carney unveils a volley of interest rate cuts and starts cranking up the printing presses again? 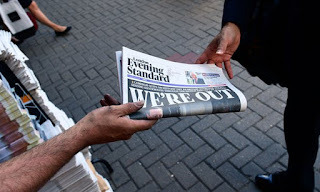 That's the big question for investors after the UK vote in favour of leaving the European Union sent shockwaves through global financial markets, and left pundits – who largely failed to predict the outcome - red-faced. The Bank of England issued a statement on the morning after the vote to leave. "The Bank of England is monitoring developments closely. Brexit consequences: What happens next? So the Brexit happened. Now what? Will Scotland leave UK? Will there be a Scottish independence referendum? 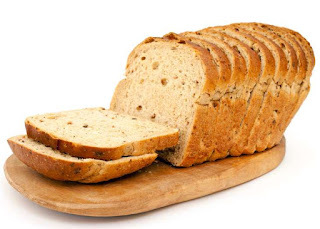 Why is Brexit such a good idea? #Brexit: How will the crashing pound affect SA travellers? 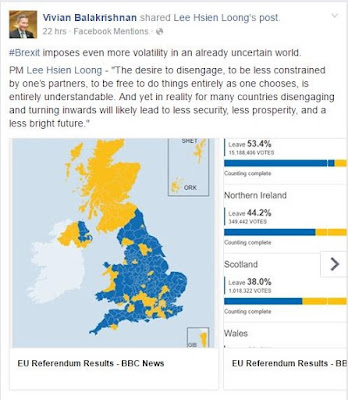 UK Independence Party Admits His Bold Brexit Claim Was a "Mistake"
Where is my polling station? Do I need a poll card to vote? Brexit is an abbreviation of "British exit" that mirrors the term Grexit. It refers to the possibility that Britain will withdraw from the European Union. 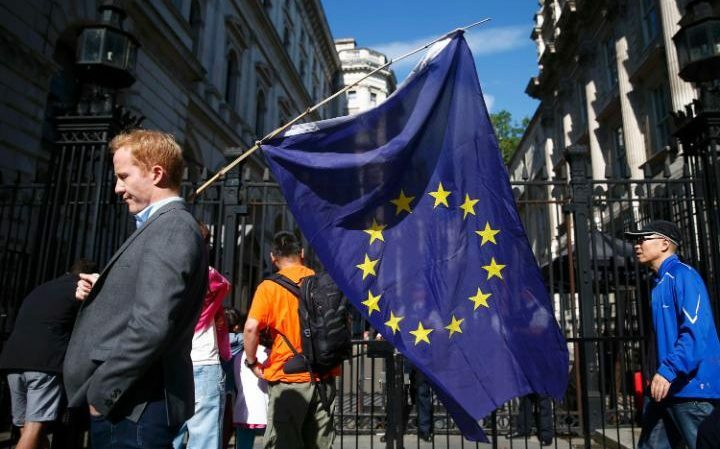 The country will hold an in-out referendum on its EU membership on June 23. David Cameron, leader of the Conservative Party and Prime Minister since 2010, announced support for a referendum on Britain's EU membership in 2013. He said that the country would hold the vote before 2017 if the Conservatives were re-elected in the May 2015 general election. They were, and Cameron pursued a re-negotiation of the terms of Britain's membership, to be followed by a vote on Brexit. Cameron supports the "in" or "remain" side (sometimes dubbed "Bremain"), arguing that the renegotiated terms he secured with European Council President Donald Tusk are favorable to Britain. Skeptics on both sides see the re-negotiation as political theater, which Cameron was forced to perform as a result of his prior sympathy to euroskeptic (anti-EU) arguments. They reason that this skepticism was not completely genuine, but at least partly calculated to head off electoral challenges.